We will be pleased to provide you with a description of your journey to us – whether you would like to start your holiday with the vehicle or the train, or if you would like to visit us by bike or by foot. Take the A23 and the A2 – Südautobahn from Vienna. At Neukirchen follow one of the two right lanes towards Bruck an der Mur / Neukirchen. From here, continue on the S6 to the junction St. Michael near Leoben. Follow the A9 in the direction of Linz / Salzburg. From Liezen take the Ennstalbundesstraße B 320 direction Gröbming / Schladming. At the Trautenfels peak, turn right onto the Salzkammergutbundesstraße B 145 towards Bad Aussee / Bad Ischl until you reach the junction to Tauplitz. Drive left over the bridge and follow the road to Klachau and from the fire brigade to Wörschachwald. Just past the small church on the right, the path to the observation tower Dachsteinblick branches off to the right. From here you can go straight to the end of the street. Take the A9 towards Linz / Salzburg. Take the A 10 towards Salzburg. Leave the motorway at the junction “Ennstal” via exit 63 Altenmarkt and follow in the further course of Ennstalbundesstraße B 320 to Trautenfels. Here turn left into the Salzkammergutbundesstraße B 145. Drive left over the bridge and follow the road to Klachau and from the fire brigade to Wörschachwald. Just past the small church on the right, the path to the observation tower Dachsteinblick branches off to the right. From here you can go straight to the end of the street. Follow the E45 / A10 to the Inntaldreieck and follow the signs for the A8 to Salzburg / Rosenheim. Follow the A8 to Salzburg and continue on the A1 to the Knoten Salzburg. Here you can choose between two routes: Continue on the A 1 to Thalgau and then through the Salzkammergut or take the A 10 – Tauernautobahn direction Villach / Slovenia, Italy and further on Ennstalbundesstraße. Follow the A 1, passing Salzburg Airport and the Europark, to the Thalgau exit. Exit the motorway and follow the road to Hof. At the roundabout, take the second exit on the right to the B 158 via Fuschl am See, past the Wolfgangsee with St. Gilgen, Strobl and Abersee to Bad Ischl. After the Kaiserpark tunnel, follow the signs to Graz and turn into the Salzkammergutbundesstraße B 145 coming from Gmunden. Continue past Bad Goisern, pass the Pötschenpass, past Altaussee, Bad Aussee and Bad Mitterndorf until you reach the turn to the right to Tauplitz. Just after the turn, follow the road to the left in the direction of Klachau, past the Tauplitz railway station and the fire brigade straight on the road to Wörschachwald. Just past the village sign “Wörschachwald” you will see a small church on the right, behind which you turn right into the road to the “Aussichtsgasthof” and continue until the end. At junction Salzburg take the A 10 / E 45 towards Villach, Slovenia, Italy and follow the motorway to exit 63 Altenmarkt. From here, continue along Ennstalbundesstraße past Schladming, Gröbming to Trautenfels. Here turn left onto Salzkammergutbundesstraße B 145 towards Bad Aussee / Bad Ischl until you reach the junction to Tauplitz. Drive left over the bridge and follow the road to Klachau and from the fire brigade to Wörschachwald. Just past the small church on the right, the path to the observation tower Dachsteinblick branches off to the right. From here you can go straight to the end of the street. You arrive with the train ? We will be happy to pick you up at the Tauplitz train station. 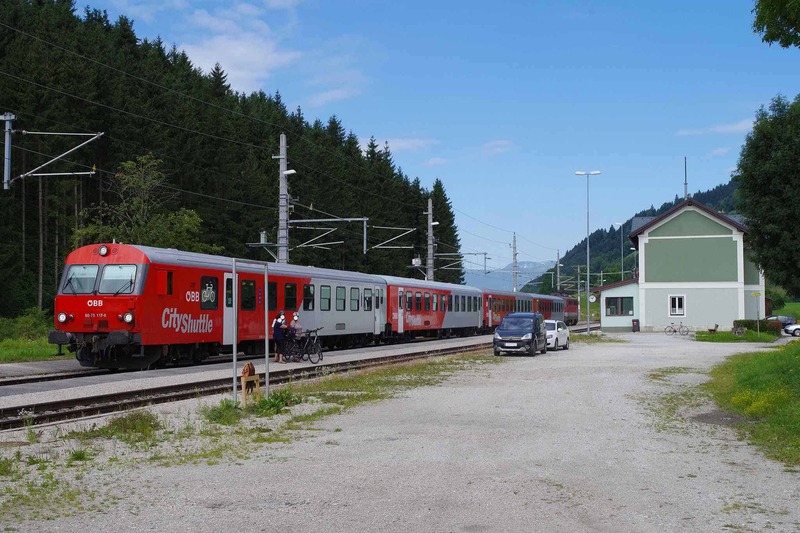 If your train only goes to Stainach-Irdning, we will pick you up there as well. Just let us know as soon as possible.